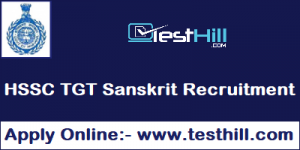 HSSC (Haryana Staff Selection Commission) has released HSSC TGT Sanskrit Recruitment 2019 notification for HSSC upcoming vacancy. HSSC notification is available from 14th Jan 2019. The HSSC TGT Sanskrit Application will start on 22nd February 2019. There are 615 Posts TGT Sanskrit (Rest of Haryana) and 163 Posts TGT Sanskrit (Mewat Cadre). The selection procedure contains the written test of 90 marks and socio-economic criteria and experience of 10 marks. You need to upload some educational documents like scanned copy of 10th/12th/graduation degree/diploma during the registration process. General category candidates and other state candidates will have to pay an application fee of Rs. 150. Apart from this, an application fee of Rs 75 for general category women and Rs 18 for SC / BC of female candidates and Rs. 35/- for SC/BC male candidates has been kept. PH candidates don’t need to pay any application fee.